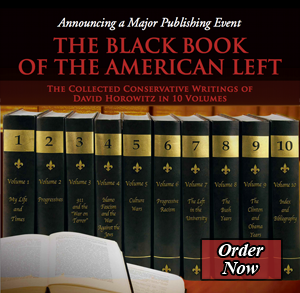 David Horowitz speaks about Party of Defeat, a work that echoes many of the same themes as Volume III: The Great Betrayal. The Great Betrayal is the third volume of my collected writings that make up The Black Book of the American Left. Its chapters focus on events beginning with the Islamic attacks of 9/11 and culminating in the Iraq War. They describe what can now be seen as a tragic turn in our nation’s history that has already profoundly and adversely affected its future. The effort to remove the Saddam regime in Iraq by force was initially supported by both major political parties. But in only the third month of fighting the Democratic Party turned against the war it had authorized for reasons unrelated to events on the battle- field or changes in policy. This political division over the war fractured the home front with crippling implications for the war effort itself and, beyond that, America’s efforts to curtail the terrorist activities of other regimes in the Middle East, most pointedly Syria and Iran. The internal divisions were greater than any the nation had experienced since the Civil War, and the betrayal by the Democrats of a war policy they had supported was without precedent in the history of America’s wars overseas. The internal divisions at the end of the Vietnam War were not at all commensurate with those over Iraq. The 1972 McGovern presidential campaign, which called for an American retreat from Vietnam, was launched after ten years of fighting with no result, when both parties had already conceded the war could not be won. The conflict between the two major parties was over how to end the war and over what the war had become, not—as in Iraq—over whether the war was illegal and immoral to begin with and should never have been fought. The Democrats’ opposition to a war they had authorized, represented a betrayal of the nation and its men and women in arms that has no equivalent in American history. The domestic divisions over both wars were initiated by a radical left whose agendas went far beyond the conflicts themselves. In the decades that followed their efforts to bring the Vietnam War to an ignoble end, the left had made ever deeper inroads into the Democratic Party until, in 2008, the party nominated a senator from its anti-war ranks who became the 44th president of the United States. Of far greater significance than the successful candidacy of one anti-war spokesman, however, was the path the entire Democratic Party took in first abandoning a war its leaders had approved, and then conducting a five-year campaign against the war while it was still in progress. I have written two previous books about this defection and its destructive consequences. The first, Unholy Alliance (2004), documented the emergence of the post-9/11 anti-war movement, its tacit alliance with the jihadist enemy and its malign influence on the Democratic Party’s fateful turn. The second, Party of Defeat (2008), was written with Ben Johnson and focused on the sabotage of the war effort by leaders of the Democratic Party, by progressive activists and by a left-leaning national media. This chorus of opposition took advantage of American missteps to conduct a no-holds- barred propaganda campaign worthy of an enemy, even going so far as to leak classified information that destroyed vital national secu- rity programs and put all Americans at risk. Political opponents of the war attacked the moral character of the commander-in-chief and the mission both parties had endorsed. This assault on America’s role in the war dealt a devastating blow to American power and influence from which they have yet to recover. It is customary and natural for human beings to identify with the communities they inhabit, and on whose health and security their lives depend. This is the foundation of all patriotic sentiment. But once individuals become possessed by the idea that political power can be “transformative” and create a fundamentally different human environment, they develop an allegiance to the idea itself and to the parties and entities in which they see it embodied. Such individuals come to feel alienated from the societies they live in but are determined to replace, and finally to see their own country as an enemy because it is the enemy of their progressive dreams. This is how generations of leftists came to identify with the Communist adversary and its cold war against the democracies of the West. When the Communist empire collapsed, I was curious to see whether this progressive reflex would survive the fall. Lacking the real world instantiation of their dreams Soviet Russia had provided, would progressives continue to volunteer as frontier guards for America’s enemies, even the most reprehensible among them? The answer was not long in coming. On November 9, 1989, the Berlin Wall came down, liberating hundreds of millions of captive people from their Soviet prison. The following August, Iraq’s sadistic dictator ordered his armies into Kuwait and erased that sovereign nation from the political map. Unlike the Soviet rulers who paid lip service to progressive ideals, Saddam Hussein was a self-identified fascist who did not pretend to advance the cause of “social justice” or liberal values. Even by 20th-century standards, Saddam was an exceptionally cruel and bloody tyrant. But he was also an enemy of the United States, and that proved enough to persuade progressives to lend him a helping hand. When America organized an international coalition to reverse Iraq’s aggression, the progressive left opposed the action as though America rather than the Saddam regime were at fault. At the time, the only reason there were no large protests against the war over Kuwait was because progressives were freshly demoralized by the Soviet debacle and still in disarray. But their mood changed over the course of the next decade. As the millennium approached, leftists began to regroup, organizing a series of large and violent demonstrations against “globalization,” the term with which they re-labeled their old nemesis “international capitalism.” When Islamic fanatics attacked New York and Washing- ton in 2001, leaders of the globalization protests re-positioned their agendas to focus on the new American “imperialism” in Afghanistan and then Iraq. Eventually, millions of leftists at home and abroad participated in protests to prevent America and the coalition it led from removing Saddam Hussein. Without overtly supporting the Saddam regime as they had the Kremlin, progressives resumed their role as frontier guards for the enemies of the United States. The chapters of The Great Betrayal consist of articles that were written as the post-9/11 events were unfolding. Because they were written as the events were taking place, the individual chapters are best read in sequence, and are arranged in chronological order for that purpose. I have edited the selections to clean up infelicities that are the price one pays for working on deadlines and in the heat of battle. Some repetitive passages have been excised, while some new passages have been inserted to clarify the historical context for readers coming at these issues for the first time. In making these texts more readable I have refrained from inserting views of the events that I did not hold or express at the time. Four years ago I co-authored a book with Ben Johnson called Party of Defeat: How Democrats and Radicals Sabotaged the War in Iraq. In it we documented the Democrats’ bad faith in supporting the decision to go to war and only four months later to turn their backs on the war while American troops were still engaged in battle. For the next five years Democrats conducted an unprecedented campaign against the war, describing it as an illegal aggression, both unnecessary and immoral. They accused America’s commander-in-chief of lying to them in particular and to the American people in general, in order to manipulate support for a war that should never have taken place.